Mikal, 29, has lived in Las Vegas for 18 years. 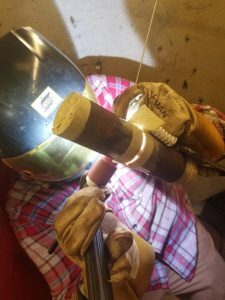 He graduated from the Professional Welder program at Tulsa Welding School in August 2018. Thanks for your time, Mikal. You came to TWS in your late 20s. Was this a career change? A major career change. I’d worked in the insurance industry as a medical underwriter and also in home care. I started up home care companies that took care of the elderly, or people going through rehab. What made you think about transitioning to welding? Hindsight is 20/20, right? After high school, I should have gone to trade school from the start. My father and grandfather are extremely intelligent, so I was always pushed to go to college. That’s what I did. I went to university to study business management and marketing, but it never excited me. I felt unchallenged and bored. After college, I spent my time in desk jobs, but I’m very good with my hands. I’d done a lot of woodworking and some experimentation making art out of electricity and wood. I watched this guy on YouTube all the time who talked a lot about welding. That’s when I started researching. Why did you decide to jump in? Do you remember the mass shooting at the country music festival in Las Vegas last year? My wife and I were right in the middle of the crowd when it happened. I heard the first few gunshots, and recognized them for what they were while people still thought they were fireworks. I grabbed my wife and we calmly started walking just before people started to stampede. Outside I found a valet who was about to run off and offered him $50 to grab my truck. We were almost home before the shooting stopped. Wow. That’s life changing for sure. It’s when I decided to do something that I was going to enjoy every day. I like putting my name on something and working with my hands, so it all kind of came together. The next week I started looking for welding schools. In January I left my wife and son in Las Vegas and went to Tulsa for seven months. I was making really good money with the home care companies, but I wasn’t happy. It just so happens that I’m skilled enough now in a job that will soon allow me to make even more money and make me happy! What was your favorite part of the welding program? Getting all the knowledge from the instructors. I asked a million questions. I am very inquisitive. If I saw an instructor doing something one way, but I knew there was another way to do it, I wanted to know why they chose that way and understand the difference between the two. I would take every weld I did up to my instructor and ask what I could do to make it better. I wanted to know what was wrong with it. Even if I was getting an A, I wanted a better A. Did you make use of the lab for extra practice? Absolutely. I went every day and welded 12 to 15 hours a day to really perfect my craft. I started that at the beginning by staying late on the first day. Like most kids who go through Tulsa Welding School, I’d never touched a welding machine before, but I caught on pretty quick. What drove you to put so much time in? My mindset was I was preparing for war. Everyone was my competition. I was going there to beat them. What really drove me was, after three weeks we had our first Top One weld competition. There was a guy in my class called Sam who I’d made into my arch-nemesis in my mind! He was my competition. I hadn’t really talked to him, but I knew he had his own welding rig and he’d been welding since he was a little boy. I was going to do everything in my power to be as good, if not better than him. Did you beat him in the Top One? After we were done, the instructor Dave Wilkins went back and forth inspecting our welds. He narrowed it down to two and I knew one was mine, but he picked Sam’s over mine and that just crushed me. I went straight home and beat myself up for about 15 minutes, then I came back to school and welded till 11pm. That desire to be the best is what drove me to stay late. Sam and I actually became best friends and hung out every phase after that. I even lived with him the last two weeks of school. He ended up winning five Top Ones. I got four, and another guy pulled one out. I’m with the Union Iron Workers here in Las Vegas. I’m glad I signed up because I’m going to get some good experience and make some good money. The thing that bothers me is that my skills are completely underutilized. 99% of the welding they do is flux-core, which is the easiest kind of welding. I thrive making perfect welds: stick welding, stainless steel, aluminum. I can make beautiful welds, and I’m not getting to do any of that right now. So it’s a start, but not where you want to be? I took it because it’s a job while I’m here, but my wife and I don’t intend to stay in Las Vegas. It’s not a great place to raise kids, and we have opportunities coming up. I had a lot of job opportunities through Tulsa Welding School, but I wasn’t able to jump on them because we want to be reasonable and save up money before we make our move. I have a short-term plan and a long-term goal. So what’s your career plan? 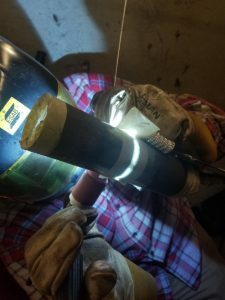 When I set my mind on becoming a welder, underwater welding was the pinnacle for me. It’s where you make the most money. There is a lot of risk, but it’s serious welding. We have friends out in St. Thomas in the Virgin Islands who own a scuba diving company, and there is a TIG welding company there that I’ve been in contact with. So we have every intention of moving to the Virgin Islands within two years. Along with doing some TIG welding, I’d like to get my feet wet, so to speak, doing some underwater welding. And your longer term goal? Before leaving Tulsa, Sam and I got together with a couple of guys two phases ahead of us. One of them is very entrepreneurial like myself. He has contacts in the shutdown side of the industry. There’s a lot of money in shutdowns, so we’ve talked about getting a group of guys together to form our own company and compete in the shutdown industry. That’s more of a long-term goal, but I also have some other business ideas in mind. I have big plans—a lot I want to accomplish and a certain lifestyle I want to live. Toward the end of my career, I’d like to go back to Tulsa and get my inspectors’ degree [Associate of Occupational Studies in Welding Technology] and become a CWI [Certified Welding Inspector]. When I’m done traveling around looking at other peoples’ welds, I’d like to teach other students how to weld at one of the Tulsa campuses. Each weld I put down is like a piece of art. Every time I put my hood down, I am absolutely focused on what I am doing. Every weld I do is essentially my signature. I think that is really incredible. You’ve got to be there. Attendance is so important. I’d never welded before and I was at the top of my class because I was there 12 to 15 hours a day. I got all As because I put the time in. If you don’t have a job, there’s no reason you can’t be there through all three shifts. If you have a job in the morning, go in the afternoon and evening. If you work in the evening, go in the morning and afternoon. It doesn’t cost anything extra to take advantage of the school’s resources, so why not use them? Everybody goes to Tulsa Welding School once, but I technically went three times in the time that everyone else went once!